Class 4 had a lot of fun today. In the morning we had a fun playtime in the morning. The children drew food on craft paper and made a restaurant. Other children played with their jump ropes. 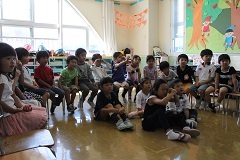 After playtime we were joined with Class 7 for morning exercise and calming. 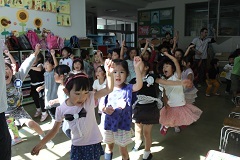 All the children could do the dance so well. Next we went back to our classroom and had our Morning Meeting and sticker book time. When we finished we sang Happy Birthday to the two birthday boys! 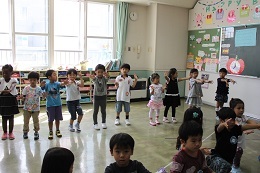 Next we down to the first floor and had Sports Festival dance practice with Class 5 and Class 6. The children did so well. Finally we made birthday craft, had English book time (Shark in the Dark), and our Goodbye Meeting!